An adjutant is a wit ex officio, and finds many standing jokes annexed to his appointment. It is on the happy application of these that his character depends. Thus, for example, when the men lose the step, you may observe, that their legs move like those before a hosier's shop in windy weather; if, in the platoon-exercise, they do not come down to the present together, that they perform the motions just as they were born, one after the other. In short, by attending a little to the conversation of the wags among the non-commission officers and soldiers, you may soon form a very pretty collection; which certainly must be sterling, as they have stood the test of perhaps a century. Reading and writing are very necessary accomplishments for an adjutant. If you cannot spell, you should keep Entick's dictionary in your pocket; but it will be of little use, if you know not the meaning of the words: so it will be best for you to get the sergeant-major, or some other intelligent non-commission officer, if there be such in the corps, to write your orders, letters, etc. If you are deficient in knowledge of your duty, the word of command given in a boatswain's tone of voice, with a tolerable assurance, and the dexterous use of your oaken sapling, will carry you through till you get a smattering of your business. The manoeuvres performed by a regiment are merely intended to show the skill of the adjutant; for, I apprehend, no other manoeuvres are used upon service, but to march up to the enemy, when the battalion feels bold, and to run away, when it is not in a fighting humour. All manoeuvres should therefore be calculated to astonish the spectators, and the more confused and intricate they are, the better. A good adjutant should be able to play as many tricks with a regiment, as Breslaw can with a pack of cards. There is one in particular that I would recommend, namely, that of dispersing and falling in again by the colours; which you will find extremely useful, whenever you contrive to club, or otherwise to confuse, the battalion. Whenever the colonel or commanding officer is on the parade, you should always seem in a hurry, and the oftener you run or gallop from right to left, the more assiduous will you appear: laying your rattan now and then over the head, or across the face, of some old soldier, for being stiff through infirmity, will get you the character of a smart adjutant. 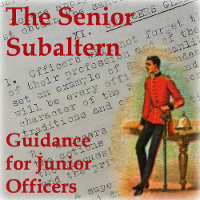 Should you make a mistake in telling off a division, shift the blame from your own shoulders, by abusing the sergeant or corporal of the division; and when, at any time, there is a blundering or confusion in a manoeuvre, ride in amongst the soldiers, and lay about you from right to left. This will convince people that it was not your fault. Be sure to listen to every piece of scandal respecting the commanding officer, and tell him of it the first opportunity. Should none be thrown out, it might not be amiss to invent some. If he keeps a lady, wait upon her with the utmost respect, be her chaperon to all public places, feed her dog, and scratch the poll of her parrotbut take care that your attention to the lady does not make her keeper jealous. This might be of bad consequence to you. Never suffer your roster to be questioned, and though it should be wrong, never condescend to alter it. The roster is the adjutant's log-book, which he is to manage as will be most conducive to his own private views. If you should therefore have a pique against any officer, you should contrive to send him upon the most dangerous and disagreeable duties; and these he cannot in honour decline: for you know, according to military rules, an officer must do the duty the adjutant orders him on, first, and remonstrate afterwards. Probably he will never returnbut if he should, it will not require much dexterity to acquit yourself, if you are upon a proper footing with the commanding officer. His friends themselves cannot say that you do him a real injury, for you put him in a way of being handsomely provided for, and of paying his debts in a soldier-like manner. If you should be appointed adjutant to a regiment of militia, endeavour, as soon as you join the corps to give the officers an idea of your military talents, by making it appear that you have seen a vast deal of service. Talk of your campaigns in Germany, and America, of the roasting you have experienced in the East and West Indies, and the cold of Newfoundland and Canada. If you have been in none of those places, no matter; they cannot dispute it, for you may swear none of them have been there.